Get creative with leftovers and serve your biggest fans this leftover smokey turkey sandwich! 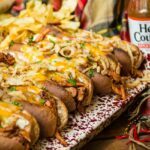 Make ahead and be the hero of the campsite or tailgating party! In a cast iron skillet, heat the oil over medium-high heat. Working in batches, heat the turkey through. Remove from pan and saute the onion and pepper until softened, 5 to 7 minutes. Add the turkey back to the pan and toss it all with the Head Country Bar-b-Cue sauce. Meanwhile, split and toast the rolls. Fill each roll evenly with the turkey mixture. Cut the cheese into strips and cover each layering up as desired. Place the sandwiches onto a baking sheet and toast once again, until the cheese is melted, 5 to 7 minutes. Garnish with fresh arugula for serving. To make this recipe for campfire or tailgating, mix the turkey with the sauteed veggies and sauce ahead of time and chill. Stuff each hoagie roll with the filling and top with cheese. Wrap in foil tightly for transport. Grill over coals, in foil, until the leftover smoked turkey sandwich is heated through and the cheese is melted. Use the foil wrapper to keep hands clean while enjoying!